These 3 curb appeal ideas bring home staging outdoors. Staging a home is an vital step in a successful home selling process. Most Realtors will tell you that staging a home correctly is necessary to get a home sold – quickly. However, the staging process normally focuses on the inside of the home. In truth, staging needs to start at the curb, long before the potential buyer crosses the threshold. The “For Sale” sign shows your home is on the market. A home with great curb signals buyers it is the home they want to see. Everyone wants a house that looks great. Great from the curb and great inside. These easy curb appeal ideas will make that “first impression” of your newly listed home compelling to buyers. With curb appeal, buyers want to get inside to see more of the home. The first thought buyers are likely to have are “How much will the repairs be?”. That may cause them to dismiss a great home or submit a very low ball offer. For most southwest homes driveways are not very long. However, they are very large element of a homes curb appeal. In many areas of Tucson, driveways are not paved. Even in the City of Tucson, some driveways may be covered with gravel. A driveway, even if it is not paved, is one of the visual elements of the home’s overall curb appeal. It actually ranks high with siding of a home, the roof, and front yard. Concrete can crack and crumble, and asphalt develops potholes. Both can be repaired quickly and easily. When tackling a driveway repair, be sure the area to be repaired has been cleaned of debris and loose materials. A good cleaning with a hose will do wonders, but pressuring washing will really get the job done. Concrete driveways cracks whether small or larger will need to be filled. Once repaired, visit your favorite home supply store or hardware to get a resurfacing product. There are lots of them. Also make sure if you have a community HOA that your color choice is allowed. The one you choose should have enough color to hide the repaired concrete surface, but not bring the neon sign effect into play. A red driveway is not adding curb appeal. Some Tucson homes don’t have mail boxes in front of the house. If that is the case for you, this is one of the handy curb appeal ideas you can skip. For those that have a mailbox, take heed. Most homes that have their own mail box have it sitting at, or near, the end of your driveway. The address numbers on the mail box are usually key to someone finding your home. Little things can mean a lot when it comes to creating curb appeal. A mailbox that looks “good” probably won’t attract much attention. The ugly or shabby one might just as well be a radio tower beacon. Just as the beacon is used to have airplanes avoid it, the mail box will do the same to buyers. For home owners living in a community that restricts the type of mailbox you can have,, you won’t have many options. Simply give your rusted, stained mailbox and the post it sits on a fresh coat of paint in its original color. If your community doesn’t have a standard for home mailboxes, you have an opportunity to create added curb appeal. Consider replacing an ordinary looking box with one that will compliment the exterior design of your home. If your home has a brick facade, consider a new one set on a brick pillar. Needless to say, the brick should match the home. If your house features field-stone accents, consider accenting the mailbox with a small, stone-trimmed planting bed at its base. The door is the point where your exterior design becomes your interior décor. Cross the threshold and all the interior staging takes effect. It’s also an element that significantly impacts how a buyer will view your home. A poorly maintained front door, signals a poorly maintained home. A fresh coat of paint or stain will make the entrance stand out. Also, don’t forget the trim around the door. 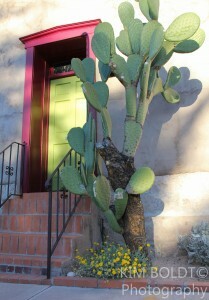 In Tucson, front doors that face east or west get beat up by the sun. If your front door is cracked, has wood rot or sever discoloring, replace it. Neither stain or paint will cover the problem adequately. And the buyers home inspector will likely call out the issue during their inspection. When the area around the door well isn’t well lit, add some lighting. Lighting will help ensure safety at night as well as enhance the appeal of the area. Adding lights will require an electrician. That will add some costs, but also value. Consider ground lights to accent the pathway to the door or even lighting up the door itself. No electrician needed. Last, take a look at the hardware on the door. If it is rusted and shabby, replace it? Replacing worn or dated door hardware is an easy, cost-effective way to improve the overall look of your entryway. These 3 easy curb appeal ideas will set the stage for a buyers entrance to your home. When you are choosing a Realtor to list your home, give higher marks to those who understand staging begins with curb appeal. Thinking of selling you home in Tucson Arizona? We can help. Our Tucson home sellers guide outlines the selling process and gives you tips to consider. We will also provide a FREE market analysis for your home for today’s Tucson real estate market. Just give us a call or submit the request of a market analysis.